Budget Bikes are pleased to offer for sale this Keeway F-ACT 50cc that is HPI clear and documented for its next owner. The bike comes with 2 keys and, owners manual and benefits from a TopBox. Please note : This bike has covered 10,320 KM's which is 6412 Miles. A fantastic 125cc cruiser with just 3,700 miles on the clock. This 1 owner machine comes in standard trim and requires no Mot until April 2021. Tax is less than £20 per year. Call today to secure this great bike. 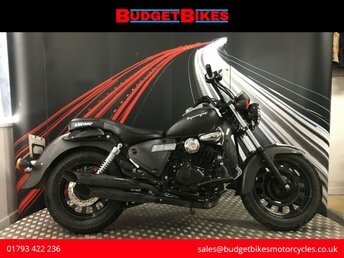 Discover the complete range of used Keeway motorbikes for sale in Swindon through Budget Bikes Ltd. 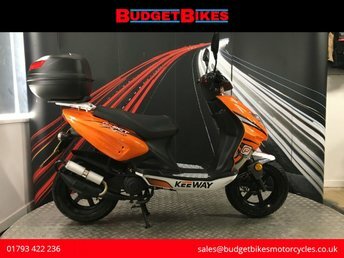 If you're in the market for a sporty 125 or a scooter to tackle the daily commute, we're sure to have a used Keeway bike to suit your budget and lifestyle. All of our second-hand motorcycles come fully inspected for your peace of mind, and each one is competitively priced. Our friendly team is on hand to offer advice and guidance when it comes to purchasing your next bike, so be sure to get in touch with any questions. Take the time to browse all of our used Keeway motorbikes here on the website before getting in contact to arrange a test ride.